From left to right, Ryan Cochran-Siegle, Tim Jitloff and Mark Engel stand on the podium after Thursday's FIS giant slalom race at Squaw Valley. SQUAW VALLEY — Truckee Olympian Tim Jitloff sliced a wire-to-wire FIS giant slalom victory Wednesday to open five days of Nature Valley U.S. Alpine Championships competition at sunny Squaw Valley. The race, a precursor to Friday’s U.S. Championship event, was held on Red Dog with firm snow conditions and a large crowd of fans, friends and families on hand to enjoy the annual end-of-the season celebration. 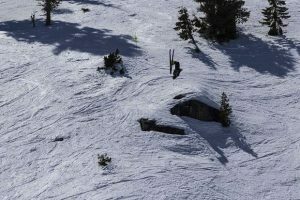 Recent NCAA giant slalom champion Mark Engel of Truckee and the University of Utah finished second, 2.79 seconds behind Jitloff, while two-time Junior World Champion and current NorAm overall champ Ryan Cochran-Siegle rounded out the podium in third. 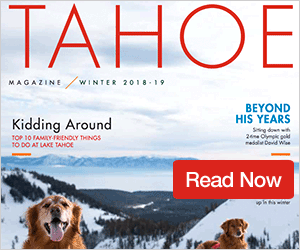 Among other racers with ties to the Lake Tahoe/Truckee area, Nick Cohee finished sixth, Sean Higgins was 15th, Bryce Bennett 16th, Erik Arvidsson 17th, James Lebel 23rd, Garret Driller 26th, Ty Sprock 29th, Addison Dvoracek 31st, Riley Plant 34th, and Cody Wilson 36th. 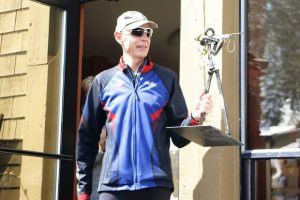 More than 80 men raced, with 34 of them failing to reach the finish line, including Olympic silver medalist Andrew Weibrecht. 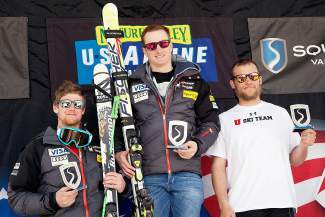 The men will compete in the U.S. Alpine Championships GS race on Friday, which will feature Olympic gold medalist Ted Ligety and Squaw Valley Olympian Travis Ganong.